The Western Virginia Railroad Preservation Society (TWVRPS) was formed in December of 2003 for the purpose of rescuing the Norfolk & Western steam locomotives and other historic equipment that has languished in the Virginia Scrap Iron & Metal yard in Roanoke for over half a century. With this equipment now in the hands of the Virginia Museum of Transportation, the Society has grown in scope and is preparing to take on a number of projects around the region. 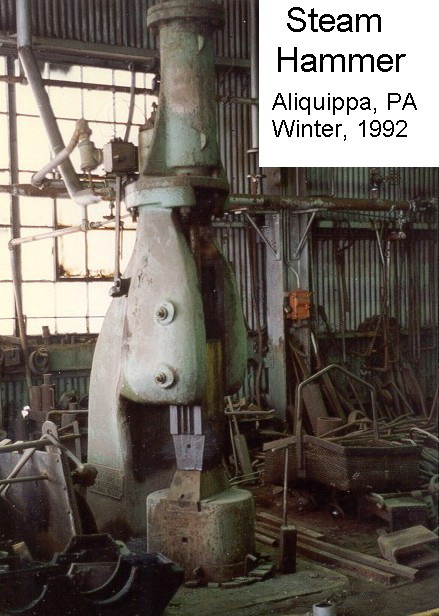 The Railroad Museum of Pennsylvania (RRMPA) has recently agreed to surplus a large, disparate collection of steam era shop tools and equipment and donate it to TWVRPS; with the proviso they come get it. The equipment includes a large steam hammer, a 24" lathe, a forge, a 60" vertical milling machine, a radial arm drill and a drill press. The steam hammer has a large crack in the base, and the steam cylinder has been repaired with what looks like a brass weld. In January of this year, Ben True, Richard Jenkins, David Collison, Nathan Myers, Robert Reynolds and the author traveled to Strasburg to look over the equipment. 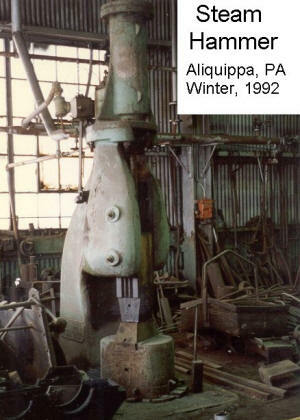 We met with Al Martin, the RRMPA Restoration Curator, who took us back to take a close look at the tools. The 24" lathe has been stored indoors so seems to be in the best potential operating condition. The table is 21" wide by 11' long. Images courtesy of RRMPA, except as noted. 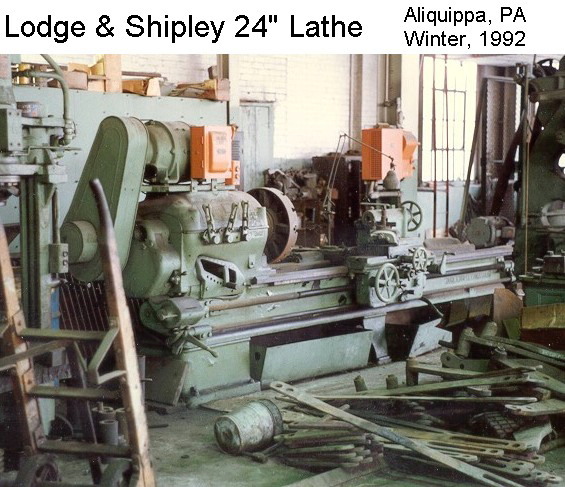 Only the lathe has been stored inside. 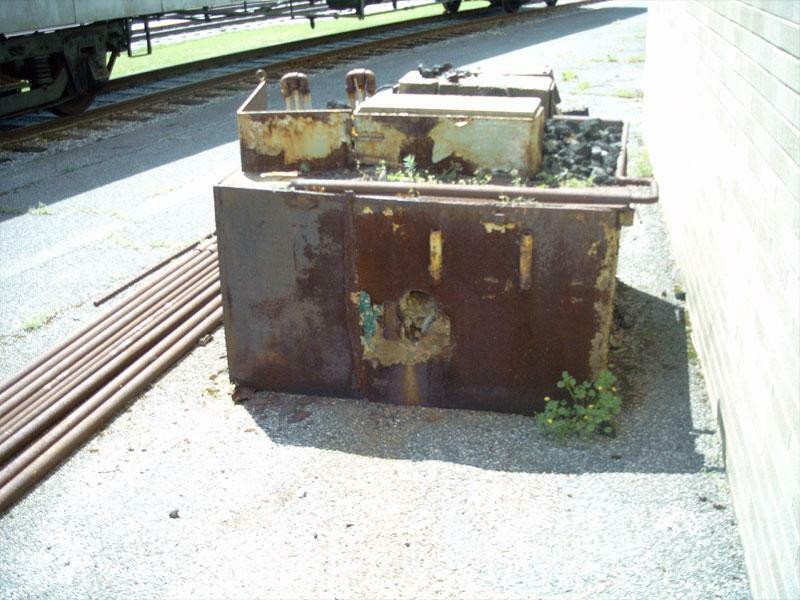 The rest of the machinery has been sitting on a flat car outdoors at the RRMPA yard for at least 10 years, and is in varying states of repair and condition. After close inspection,	Nathan Myers, who has been a machinist with Martin Marietta for over 30 years, stated that most of the tools would be useable after dismantling, cleaning up and reassembly. 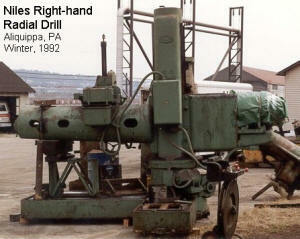 He also said, that the lathe should run pretty much as is since it has been stored inside. The forge, 29" high X 51" square, looked like a rusted steel box filled with concrete, firebrick, and coke. The door has been welded shut. Probably the most valuable thing on it is the firebricks. Photo by Ben McKnew. The machine tools were bigger than I was expecting, but Ben True was expecting them to be a lot bigger than were. Regardless, after looking over the equipment, Ben stated that we should only need one gondola, or flat car, to move the equipment, instead of the two he initially thought. The 60" vertical milling machine, will need new drive belts at the very least. 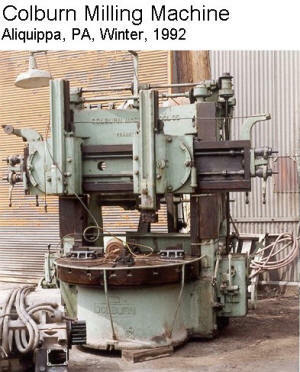 TWVRPS would like to relocate the equipment to either Natural Bridge, Virginia, pending permission to store it at the Clifton Forge shops, or as an alternate site, Roanoke. The long range plan is to set up a shop to be used for restoration work on other potential future TWVRPS acquisitions, and to do work for other groups as well to make money to sustain the society. The group is facing a spring deadline of April to move the machinery as, at that time, RRMPA wants to start rehabilitation of the flatcar that several of the items are resting on.� Consequently, they are seeking inputs, large or small, on how to move the equipment to the new location, suggestions for fund raising, and donations for the move. The arm for this machine has cast holes in the side, so every time it rains this arm would fill with water and there is a lot of rust inside. It has its original bulbs still in the lamps. Or email the TWVRPS at twvrps@yahoo.com, or the author at doowoppie@adelphia.net.